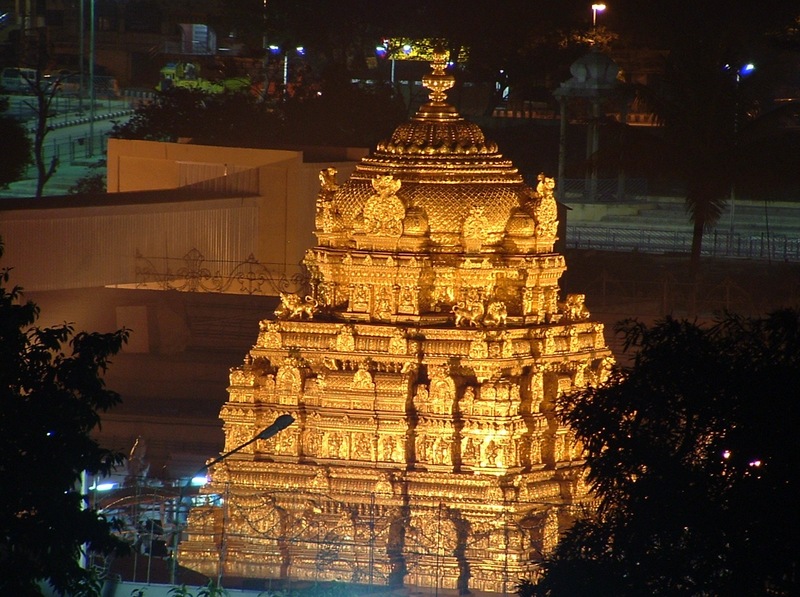 Tirumala Venkateswara Swamy is one of the richest temples in India. It is located in Tirupati, Chittoor district of Andhra Pradesh. 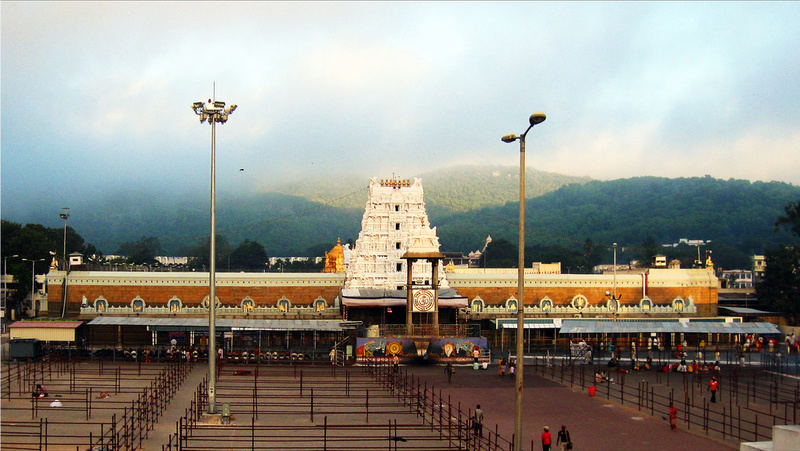 It is located on the hill town of tirumala which has seven peaks, each peak designates individual Hindu gods known as Seshadri, Neeladri, Garudadri, Anjanadri, Vrushabhadri, Narayanadri, and Venkatadri. 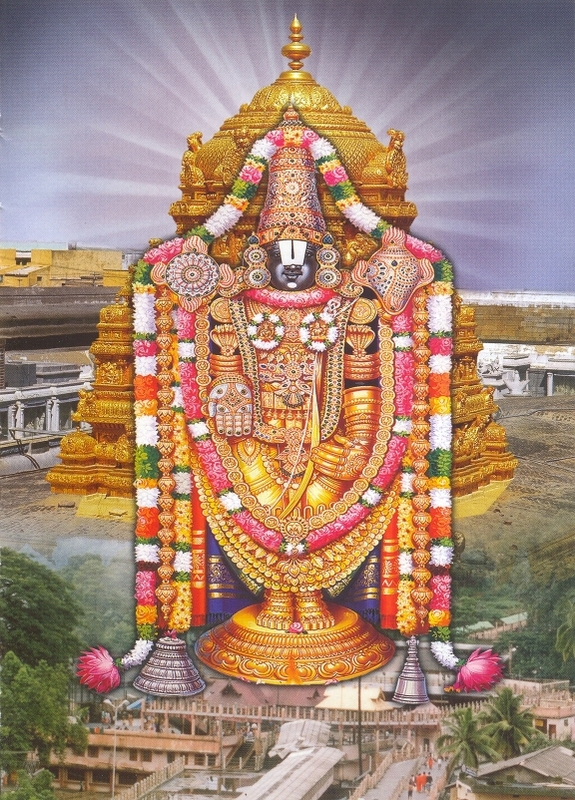 Tirupati is also called as Kaliyuga Vaikunta. It is one of the richest pilgrimage place, people from all corners of the world visit. Emperumaan, Sriman Narayanan is found as Lord of the Seven Hills known as "Eazhumalayaan" stands in this temple all alone in Nindra thirukkolam and is giving the seva to lots and lots of Bhaktas. After the world has been created, Trethayugham, Dwaparayugam and Krithayugam all went and in all these yugam, as stated by Sriman Narayanan in Mahabharatham, he took Avathaar in some form to establish Dharma and fought and destroyed "Adharma" or evil. After all these Yugams finished, Kali yugam started from then, all sorts of Evil things started to spread along throughout the world. Great Emporers lost their Empire and lots of Yogis and Rishis were killed and their wives were captured by Arakkas (Demon). At that Kaliyugam, a wild demon by named "kali" emerged in this yugam who made the earth loose its beauty and spread various evil aspects in the midst of the human minds. In Kaliyugam, person who has money and body strength are respected and all the good things like human relationship, guru and his students relation, cheating others for money and lots of sinful action were performed. Lord Brahma was so scared on seeing the Earth in this manner. Finally he thought, the right person to cure this is Sriman Narayanan and if his divine thiruvadi (feet) is touched on the lands of earth, it might regain its lost beauty and if at least a drop of his blood is shed on earth, the earth become pure and thereby all evil things might diminish. He said this to Narada Maharishi and he should take of this. All the Maharishis had a meeting that a very big Sacrifice known as Yaagam must be done and how much amount credit should be given to which god? Narada told that it should be given to one among the 3 moorthies who stands as the structure of Dharma and Sathyam and he should be capable of withstanding all sorts of Adharmams. Finally, he ends by saying that Brighu Maharishi is the right person who can do this in finding among the 3 Moorthies who is person with the said Characters. After this, Brighu Maharishi went to Brahma devan's Sathya logam. There also he was not greeted properly, he was not noticed. It was him, Brahma devan who asked Narada Maharishi for this to happen but it is fate that all this should happen. After being un-noticed by Brahma and Saraswathi, Brighu Maharishi got angry on him and like the same way, as he cursed Shiva, he gave Brahma devan a sabham that there should be no temple for Brahma in the Bhoologam and after this he went straight to Vaikundam. After entering into Vaikundam, he saw Sriman Narayanan sleeping in Aadhiseshan. He could not be so calm since he was not greeted and taken care properly by Brahma devan and as a result he had given them the Sabham. As a result, he burst out like Volcano and went straight towards Sriman Narayanan and kicked him on his Thirumaarbhu (divine chest). After being kicked, Sriman Narayanan woke up and asked Brighu Maharishi to sit and did Padha pooja for him. Brighu Maharishi is a person who has an eye on his feet. Because of this he was so angry and the perumal plucked the eye from his feet and as a result he lost all of his anger and finally thought that all of the Yoga credit must be given to Sriman Narayanan and came to the Yoga place. As we can notice, it was Brahma devan that who started the process of finding to whom the yaga credit should be given but finally he got cursed that he should not be worshiped in the earth. Its all a pre-written one and it is left to destiny that these are the things that should happen. But, as Brighu Maharishi kicked the thirumaarbhu (divine chest) of Sriman Narayanan, Lakshmi piratti left him from Sri Vaikundam and came towards the earth. Because of this, Sri Vaikundam, the Moksham lost its grace and brightness and all of these are said to be only because of Kaliyugam. After being alone in Vaikundam, Sri Vishnu could not be in Vaikundam and came towards the Bhoologam in search of Sri Mahalakshmi. Aadhiseshan turned as the mountain of Tirumala and the perumal roamed all along the earth without knowing what to do. He forgot all of his duties and he lost his conscious and sat like a person without having food, water and anything else. On seeing this, Brahma devan and Shiva came down towards the Earth known as Bhoologam as a cow and calf and were finally handed over towards the Chozha king. Once a cow-boy person took the cow and the calf for making them to eat. But in the land, the cow (Brahma devan) and the calf (Shiva) went towards the putru (ant-hill), where Sri Vishnu was found. The cow and the calf went towards the Ant-hill and gave Sriman Narayanan the milk. This happened daily. But the cow-boy could not understand why this particular cow is not giving milk while the other do. so, finally he made up in his mind that he should follow the cow and the calf and find the reason for not giving milk. The next day he took all the cows for the gracing to the plains but his eyes was watching only the cow (Brahma) that's not giving milk daily. As a daily practice, the spiritual cow went towards the Ant-hill and poured all of the milk inside the ant-hill, where Sriman Narayanan is found. On seeing this, the cow-boy went to the Chozha King and told the reason why the cow is not yielding milk but dropping the milk only at a specific ant-hill. Then, the king sent some of his soldiers and asked them to destroy the ant-hill. On that time, the cow as usual went towards the ant hill and gave milk. During the same time, the cowboy tried to hit the cow with his axe, he threw the axe towards the cow. But, to help and save the cow, the perumal came out from the anthill and held the axe in his head. The axe directly struck the forehead of the perumal and made a deep cut and as a result, the blood came out and finally it fell on the earth thus, finally the earth was freed from all sorts of evil activities that's being done by Kali. As the Emperumaan divine feet was stamped on the Bhoologam, it got its purity and the perumal gave his seva first to the cowboy in spite of causing wound by throwing the axe on him. But, as said by the Lord in Bagavath Gita, "Do your duties, without expecting the return". As said by the perumal, the cowboy did the right duty of stopping the cow which gave the milk to the perumal. He didn't expected anything. Its his duty to take the cow out and get the milk from them. As a result, he was the first person to get the dharshan of the perumal. After coming out from the ant hill, the perumal went towards Sri Varagha moorthy who helped out Bhoomipiratti from Hiranyatshakan, when the perumal took the Avathar as "Sri Varaghar". The perumal asked for some place to stay in the hill. As Varaghar could easily feel that the perumal is feeling the absence of Lakshmi piratti, he offered the perumal some land on the hill and he asked for a boon - varam. It is that every bhaktas should worship Varagha swamy first then only they should worship the Sri Srinivasa perumal. If they worship him directly with praying Varagha moorthy, the perumal should not give his blessing nor take their offerings. The perumal accepted it and promised him that the Prasadham and his darshan will be offered first to Varagha moorthy and then only it would be offered to the perumal in Tirupathi. Thus, the perumal got the place to stay on and this hill is the Venkatachala hill (Tirumala). Varagha moorthy also sent Vakula maligai along with the perumal to help him out in the house. Vakula maligai is none other than Yasodha the mother of Sri Krishnan in Sri Krishna Avatar. During that avatar, the perumal had promised her that in Kali Yuga that she will be given his seva and she will be seeing the perumal in Kalyana Vaibhavam, as Kalyana Moorthy. One day Lord Srinivasa who went to forest to hunt, he chased wild elephant. With the sight of elephant, princess padmavati and her maids were afraid and started pelting stones. Injured srinivasa reaced to vakula devi and narrated the whole story. Vakuladevi learnt from the maids of padmavati devi that even she was pinning for srinivasa. 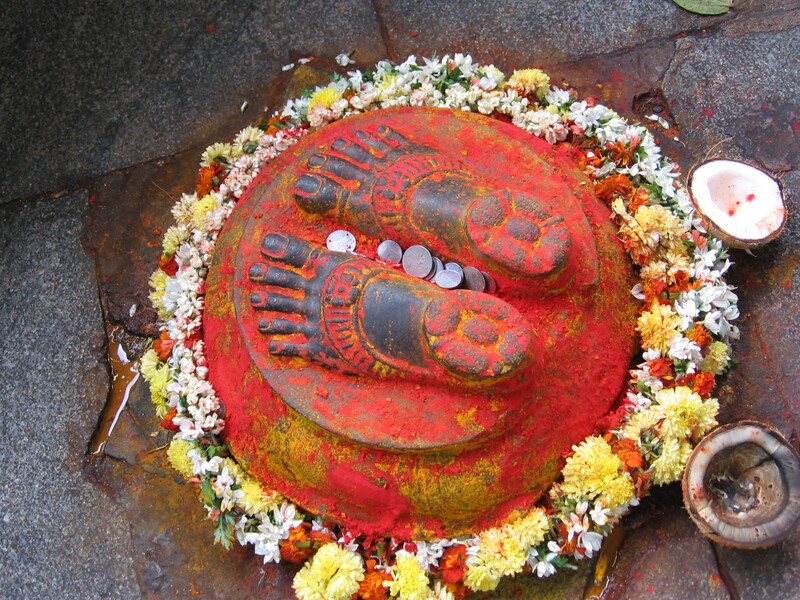 Both Lord Srinivasa and Padamavathi were ready to get married with acceptance of their elders. 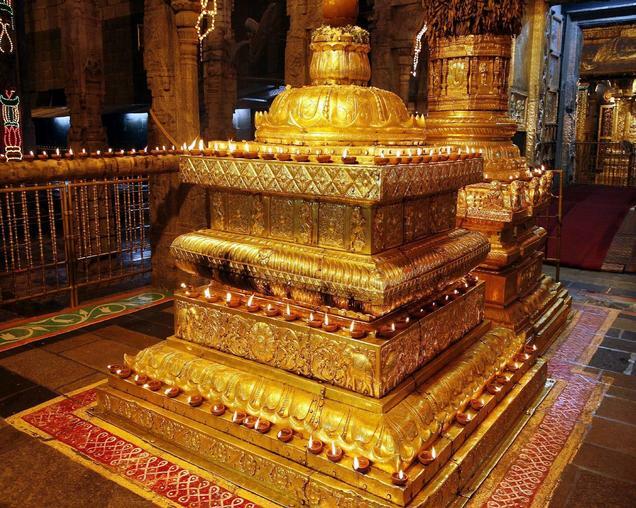 In order to overcome marriage expenses lord Srinivasa sought a loan of 11,400,000 gold coins with Lord Kubera. Understanding the commitment of Lord Vishnu towards Godess Mahalakshmi, she chose to live in his heart forever. One can see the beautiful and white temple Tower - Vimaanam, which is known as "Aananda Nilaya Vimaanam". 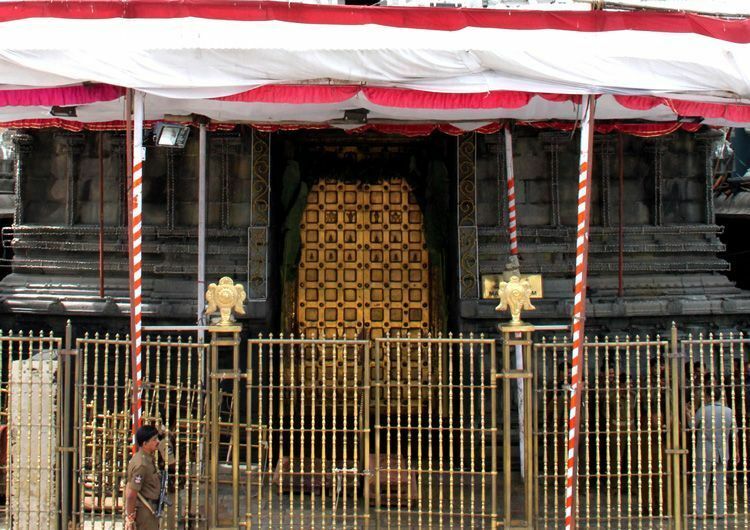 This Tirupathi temple is about 400 feet in length and 250 feet width. There are two Towers known as gopurams to this perumal. One is the outer Tower - Gopuram and another is InnerTower - Gopuram. For two Gopurams, there are two Pragharams. The worship done in between the two pragharams is referred to as "Sampangi Pradhakshanam". The worship in between inner pragharam and Garbhagriham is referred to as "Vimana Pradhakshanam". Major chunk of devotees who visit this temple often go by a stairway to the main temple. This stairway is spread across 7 hills, starting at Alipiri, and consists of a walk of 11 KMs. People usually take around 3 hours to 6 hours to finish the trail but the experience is worth every step. The pathway to Tirupati has some interesting points in between like the deer park, a few photographic valley points and also there is a mid section of the route where people pile up the stones on the road to make a 3-4 storey structure which conveys to god that they need a house to build and it's a request to grant their prayers. 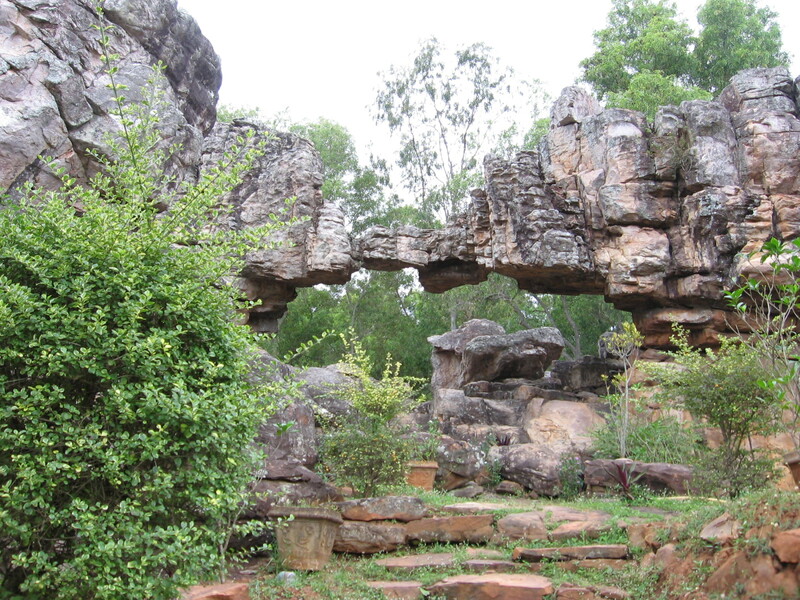 The rocks in this mountainous region are very old and the Sila Thoranam - Natural Arch formation is a rare sight not only in India but also in the world. The timings for darsanam are different on different days of the week. Please refer the weekly temple programme for the timings. 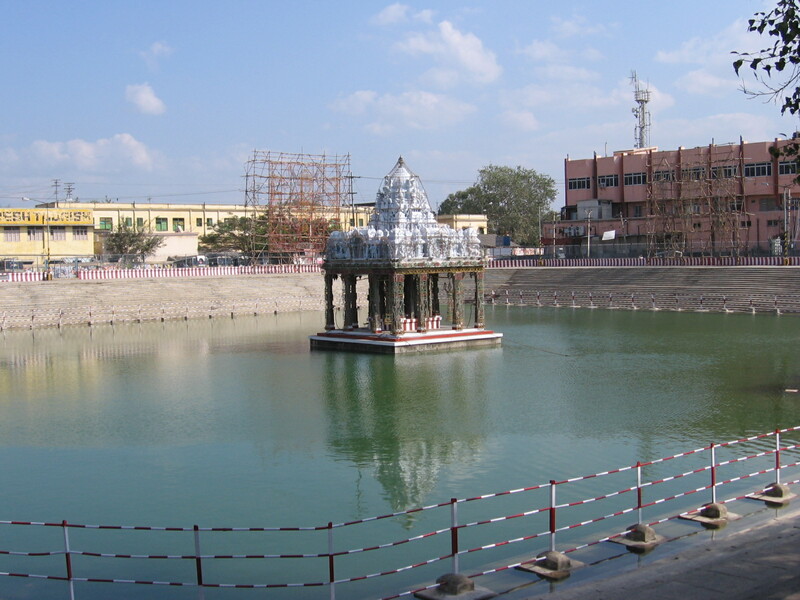 This divyadesam is located in Tirupati, Chittoor district of Andhra Pradesh. 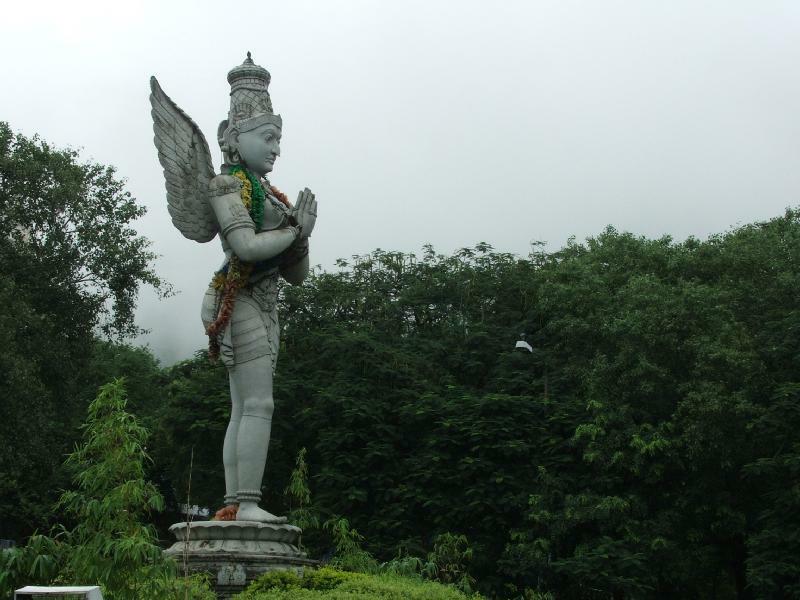 It is located on the hill town of tirumala which has seven peaks.